On the 16th of October police were asked to move along by rev. Dr Giles Fraser, Canon of St. Pauls Cathedral. What were they doing? Matteo Bergamini went to find out. A protest on reckless banking was on its second day on Sunday when a 300 strong group decided to camp outside the cathedral. As they fought against the great monolith, a line of police started to form, placed there to protect the church. However, rather than asking the police to dispatch with the protesters, Rev Fraser requested the Police itself to move along. This small group of protesters were part of the march on the London stock exchange protest march that occurred on the 15th of November. capitalism do the same? Protesters are setting up for the long haul, with a portable kitchen being set up amongst other necessities donated by well-wishers. This movement wants to challenge bankers and financial institutes who have gambled and recklessly played with the economy; it was inspired by the occupation of Wall Street in America earlier this year and was aimed at the London Stock exchange, however it was thwarted by police who managed to divert the protests away from the banking centre. 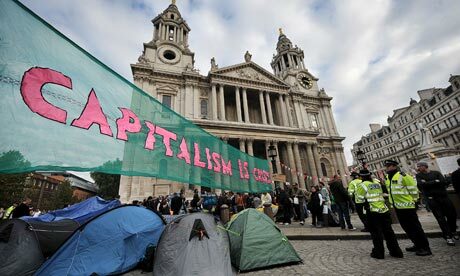 The police used “containment” tactics on the 2,000-3,000 protesters, many of them dispersed, yet a small group managed to set up camp in the church yard of St. Pauls Cathedral. Though peaceful now, on Saturday the seen in front of the cathedral was very different. Some claim a disproportionate amount of force was used on the 2,000-3,000 protestors demonstrating. The metropolitan police did indeed claim that some “containment” methods where used, but then stated it was to prevent a “breach of the peace”. protest freely? It can be speculated that if the Canon of ST. Paul’s Cathedral had indeed complained about the camp rather than defend it, the protest would surely have been shut down. Is this democratic? The majority of people work day after day with no power of influence unless they cooperate and work together. Yet every time they do, police enforce “containment” tactics to stop a breach of the peace. A breach of the peace… It is being used so often now a days that it’s more common than rain in England now. On the 16th of March in 2010 a protest by the EDL and a counter protest by the UAF meant many people where being detained on buses and in gardens without any of the standard procedures expected from a law enforcement unit in a developed country. Britain. It normally means that they will march through a section of the country to prove a point, it has to be inconvenient for the party they are striking against otherwise there is no point. The march on Saturday was to show how upset people were at the banking system and more specifically, at bankers. A similar march had taken place in the inter war depression period in America. Yet they could not march on the stock exchange in England as their efforts were thwarted by the police. Demonstrations and protests are a key stone in our democratic process; let us not lose sight of this fact.